In the last blog, I wrote that capturing the voice in direct response copy is largely irrelevant. In fact, it’s totally irrelevant. Remember … as a direct response copywriter, my job is to motivate readers/viewers/listeners to take the next step in the sales process. This task revolves around benefits, the offer, clarity, headlines, and answering the question the potential buyer is asking: “what’s in it for me?” The potential buyer DOES NOT care about your voice. They care about their favorite person, which is … drum roll … themselves. Last year, an advertising agency contacted me with an emergency project. I’m always happy to help. I had to rewrite a video script. I simply wrote direct response copy how I usually write copy. But I always like kudos! Now … I can “turn up the volume” a bit and turn it down depending on the product or service but that’s not capturing the “voice.” You can see my guide to direct response volume here. I can write “shamwow” copy that’s loud or I can write quieter copy that’s significantly toned down … say for a current client who owns retirement communities. But that’s not voice … that’s VOLUME. Do you want to capture the voice or do you want to sell your products/services? Do you want kudos and awards for your advertising or do you want money in your bank account? By Scott Martin, Direct Response Copywriter. Writing direct response copy is always a challenge. 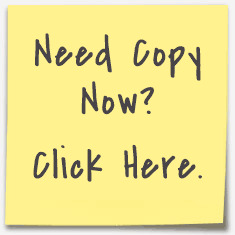 My clients expect the copy to turn readers into buyers – it’s the reason they hire a direct response copywriter. So direct response copywriting is not for meek. You MUST understand the fundamentals then seek to become an expert. No writer ever really masters this craft … or trade … or profession … whatever you want to call it. Like other direct response copywriters, I’m simply trying to improve a little every day. I’m never going to say it’s easy to write copy but there’s one instance when it’s easier and another when it’s significantly more difficult. Let’s start with the latter. Sometimes, a client will ask me to write copy aimed at two, three, or even four groups. Yes, the product might appeal, and be useful to, a broad range of people but writing copy for different people with different interests can be excruciatingly difficult. The copy ends up diluted and vague, at best. Think about a car salesperson trying to sell a car to a room full of people, all of whom want something very different from a vehicle. I’m not sure the salesperson would sell much. However, in a one-on-one situation, the salesman can really discover what’s motivating the buyer and will focus on the features that truly appeal to the buyer; it might be the sound system or it might be the mileage. So when the copy is really, really focused on the person who can, and will, buy the product, it’s easier for this direct response copywriter to write the copy … and the results are always significantly better. Marketing is always easier when you initiate a conversation with the person who will, and can, buy the product or service. You will get this key person to buy PLUS you will get others to buy … always a pleasant surprise. My father is a musician. In fact, he’s one of the world’s top classical musicians. As a professional, he gets paid to play his instrument – the double bass. But he’s attended many an audition where he has played for free in the hope of securing full-time employment with an orchestra. An audition is a speculative venture but with a big carrot. Is that a mixed metaphor? I hope not. As a direct response copywriter, should I write for free in order to get some work? I thought about this a few days ago when a company called MAGNETT asked me to join a Copywriting “Fight Club” where I would compete against other direct response copywriters … in front marketing decision makers. I’m launching a friendly copywriting "fight club" where 2 experts individually write a short piece of sales copy for an existing entrepreneurial product/service. I then run an A/B split test to see which experts' copy converts better, with real-world sales & results. As a skilled copywriter, I was curious if you might enjoy the fun challenge of a friendly matchup with another expert? It'll also be an opportunity to attract new clients/followers by showcasing your results with real data. I understand if you’re too busy to answer in depth or would prefer not to discuss given we don't know each other. However, if the copywriter in you has any pearls of wisdom or specific thoughts, they would be greatly appreciated! Noteworthy contenders already include Joanna Wiebe from Copy Hackers, Will Hoekenga from Copygrad and Peter Bowerman, The Well-Fed Writer. Thanks in advance and I hope we can connect. Thanks, Pete, and you’re kind to consider me. A couple of questions. What sort of products and services are we talking about? How does the pay work? I see it more as an opportunity for the copywriters to grow their audiences than as a direct exchange of copywriting services. So the writers who have agreed so far are doing it free of charge. I plan to create a leader board of sorts showcasing participating copywriters' performance statistics. I've already had interest in this concept from some online marketing peeps, with followers in the 6-digits, who have promised to share with their audiences when I launch. So there will likely be quite a few eyes on the writers' results, which will likely generate new work. And if the business which the copy is written for are happy with writers' results there may be opportunities for more work there too. Quite frankly it sounds like a totally crazed business model. I write for free and a project could take several hours. They test against copy from another writer … in real time. The fight attracts attention for people who buy copy. I get exposure. But there are no guarantees I’ll escape with any leads or money. Sounds like this crowdsourcing junk. And then we all know how fickle testing can be. From my end, A v B testing is hard, as any direct response copywriter will tell you. You can get smacked in the face … even if you thought the copy was great. If a legitimate company wants a spec piece and I’m interested in that company, I will write for free. I will write for charity for free. I will write a free resume for a friend. But I won’t write free copy for a site where I might lose – even though the copy is good -- especially when the guy who runs the site is trying to make money; his business model is based on not paying copywriters. THANKS! Some companies offer low pay for copy. I won’t write for free in order to get poor pay. Makes sense? I wrote free copy for a contest at the AWAI Boot Camp because it gets me on the radar of a major financial publisher. I met the guy who sends big projects to writers. To get a direct response copywriter to write for free, there has to be a clear route to tons of work from big names. It will be an audition. I’m OK with that. But setting up copywriting death matches is a bit much and something I’ll avoid … mostly because I’m busy with paying clients.